Dr. Deloris Thomas serves as the Vice President of The Joseph Center® where her responsibilities include the strategic leadership, business development, and global operational direction for the Joseph Business School (JBS) and its related entities including the U.S. Small Business Development Center (SBDC), the U.S. Procurement and Technical Assistance Center (PTAC), the International Trade Center (ITC), Continuing Education and Professional Development (CEPD), and the Carver Innovation Center (CIC). Dr. Thomas established and expanded the flagship entrepreneurial program by offering a multilingual online version translated into English, Spanish and Portuguese. She successfully secured national accreditation for JBS. Dr. Thomas has traveled throughout the United States and around the world to over 60 different countries including Mongolia, India, Nigeria, South Africa, Russia, Bulgaria, Brazil, Nicaragua, and Australia empowering people to become successful entrepreneurs. She has established Joseph Business Schools and expanded global partnerships with 22 locations across five continents including Europe, Asia, Africa, South America, and North America. Dr. Thomas teaches Marketing and Leadership at JBS and has a diverse business background including over 18 years experience in marketing and strategic planning with consumer products companies. Previously she served as the Corporate Director of Marketing and Media at Living Word Christian Center and Bill Winston Ministries headquartered in the Chicago greater metropolitan area and in South Africa. Before her work in the non-profit sector, she held several sales and brand management positions with Xerox Corporation, Pepsi-Cola Company, and Kraft Foods as well as strategic planning and business development posts with Sears Roebuck & Company. She served as a National Advisory Board Member to the United States Small Business Administration. Dr. Thomas also served as a Board Member to Integra Ventures, a non-profit marketplace ministry venture capital group designed to facilitate entrepreneurial growth in Eastern and Central Europe. She currently serves as a Board Member for The Merge Summit, an organization designed to bring Kingdom principles to the arts and entertainment industry. Dr. Thomas was selected for a Notable Woman in Education Award in the May 28, 2018 edition of Crain’s Chicago Business. 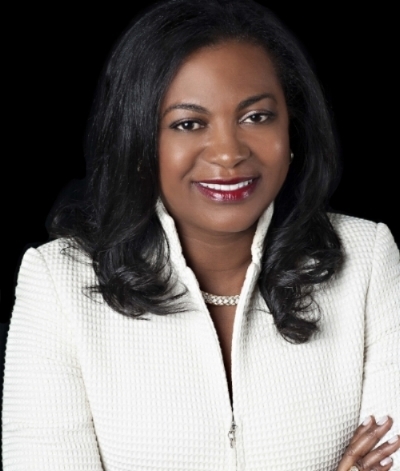 She founded and served as President and CEO of Sterling Thomas, LLC, a management consulting firm. She serves as a consultant for the OWN Network television series Greenleaf. Dr. Thomas authored her first book, Awaken to Leadership. Dr. Thomas holds a bachelor's degree in marketing from Bentley (College) University, an MBA from the Harvard Business School, and a Ph.D. in organizational leadership with a focus on entrepreneurial leadership from Regent University. Dr. Thomas is happily married with children.